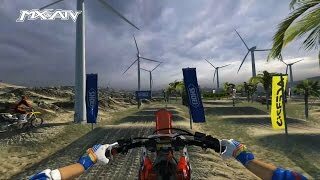 MX vs. ATV Supercross Encore (game, 2014). A racing video game by THQ Nordic/Nordic Games Publishing/CokeM Interactive. Developed by THQ Nordic, MX vs ATV, Rainbow Studios, Nordic Games Publishing. Official Trailer. MX vs. ATV Supercross Encore is a racing video game by Nordic Games Publishing, CokeM Interactive and THQ Nordic, developed by Rainbow Studios, Nordic Games Publishing, THQ Nordic and MX vs ATV. MX vs. ATV Supercross Encore - Xbox One Release Trailer. The core focus of the game allows for the player to race supercross on motocross bikes or ATVs, similar to Reflex and Alive. Nordic Games also promised to bring back as many features from the original game as possible. The game features 17 Supercross Tracks for both MX and ATV riding and a career mode with 5 series (250 East, 250 West, 450 MX, 450 ATV, 450 MX vs. ATV). There are also more than 80 motocross companies in the game to ensure authenticity and 40 riders to race against. New physics and control system including reinterpreting the "pre-load" from the original MX vs ATV games is also introduced in the new game. The game received regular content updates. As for the multiplayer, it can with up to 12 players. Split-screen is also available for two local players. The core focus of the game allows for the player to race supercross on motocross bikes or ATVs, similar to Reflex and Alive. Nordic Games also promised to bring back as many features from the original game as possible. The game features 17 Supercross Tracks for both MX and ATV riding and a career mode with 5 series (250 East, 250 West, 450 MX, 450 ATV, 450 MX vs. ATV). There are also more than 80 motocross companies in the game to ensure authenticity and 40 riders to race against. New physics and control system including reinterpreting the "pre-load" from the original MX vs ATV games is also introduced in the new game. The game received regular content updates. As for the multiplayer, it can with up to 12 players. Split-screen is also available for two local players. MX vs. ATV Supercross Encore was scheduled to be released by THQ Nordic, Nordic Games Publishing and CokeM Interactive on October 28, 2014, on October 27, 2015 and on July 15, 2016. This video game is available for the following platforms: Linux, Microsoft Windows, OS X, Playstation 3, Playstation 4, Xbox 360 and Xbox One.